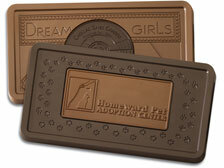 Make a lasting impression on your clients, employees and guests! Our delectable chocolate combo bar is available in 2 ways – a dark chocolate center with milk chocolate background, and a milk center with dark background. The bar is 13-¾” x 8” x ¾” thick. A chocolate smashing hammer is also provided to make breaking up and sharing the bar easy!